Nominate or tell someone today! The Spark School for Innovation by Design is an experience through which great people unlock their innovation potential and let free that version of themselves that they’ve been holding back from the world. It offers a different kind of immersive executive-style learning journey with a relentless focus on developing the key competencies and environments required for designing and accelerating innovation – in your project of passion, in your career, and in your life. Join us! The launch week was full of epiphanies and powerful light bulb moments. I was able to connect dots to understand how to be a more powerful leader around innovation. I now have better tools to create ideas as well as push those ideas to stronger innovation spaces. A great mix of theory and practice contributed to a launch week filled with insights not only about how to foster a culture of innovation back in my own organization but also with take-away tools needed to be able to execute. 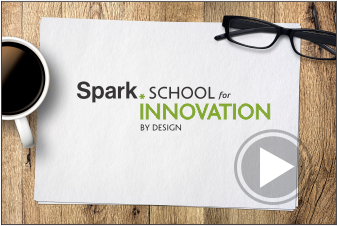 There is incredible value in the Spark School for Innovation by Design. I would have spent a fortune gathering this type of knowledge from various sources yet here it is offered up to me with better information in a unique and productively deliverable way. Our opportunity venture projects force us into action. This program puts us on the edge of a cliff with our ideas. It’s so easy to step back into safety. The program encourages us to jump with the knowledge that it will help us soar. Stacy Harwood, Lead DesignerOneWest Events Inc.
envision innovative futures and live their way into them. 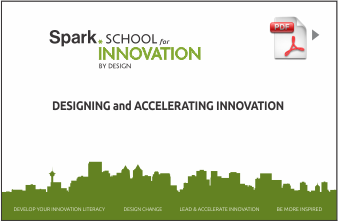 In the Spark School for Innovation by Design you will specialize on innovation and creativity – developing your own innovation literacy, designing your practice in the world around you, and learning by doing what inspires you. We want you to take the experience to every other part of your life and career. Nominate someone today. Or nominate yourself! 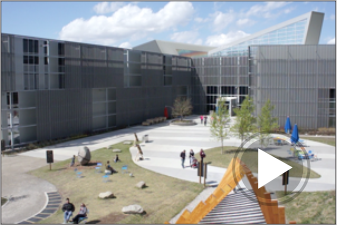 TELUS Spark » is a 21st Century learning centre committed to fostering innovative thinking in our community through a culture of curiosity, risk-taking, and problem solving. It nurtures a wonderful place for innovation and boasts an incredible space that is the first purpose-built building of its kind in Canada in over 25 years. It is known as a role model and a force for innovation that drives positive change in Canada. The Innographer » is a practical open education and innovation design firm that helps people (learn to) innovate. The focus of its work is on helping people and organizations build their innovation literacy. It develops and delivers internationally award-winning approaches for innovation, strategic ideation, idea modeling, business design, and other key areas related to innovator development. We had a very successful launch in January 2016 and we're on the hunt for 20 incredible people to join our growing cohort of innovation leaders starting October 17 2016.